How Much of the Vancouver Market is Driven by Fomo? I know right off the hop this title is going to ruffle some feathers. Especially those who point the finger at foreign buyers and better yet, foreign capital. Now don’t get me wrong I’ve mentioned before that I’m all for taxing foreign capital I even think taxing foreign buyers is better than nothing. As I mentioned in my post What To Make of the Vancouver Foreign Buyer Tax. However, foreign buyer aside this market has gone bananas with or without them (especially with them) I’ve witnessed it first hand, it’s crazy! I have friends that are making under $20/hour and they’re talking about buying a place. They have no money, heck they can barely afford their beer league hockey fees. “I’ll just put 10% down, or whatever.” I have to pull them aside and bring them back to reality. Much like Tulipmania. The story back in the 1600’s where the price of a Tulip was driven by human psychology, the fear of missing out. Prices went up and up on a Tulip flower and everyone wanted to cash in. The price of a tulip exceeded the annual income of a skilled worker. Then all of a sudden it crashed. The tulip was the first noted major financial bubble. The tulip bubble, much like Vancouver real estate has gone up and up, far out pacing what people can realistically afford. But everyone wants a piece of the action. Now obviously a home is always something that will be needed and should not crash like a tulip bulb. However, the same human psychology can be applied. Of course we all know of the herd mentality. Where people follow what other people are doing, it’s natural human behaviour. Just like a herd of sheep follow their Shepherd. A great article on a herd driven housing bubble in Australia here. Speculation in Vancouver real estate has already been seen as I wrote about in my posts Vancouver Real Estate Speculation Runs Rampant and Telus Garden Resales Explode. This brings me to this popular illustration from Jean-Paul Rodriguez in the Department of Global Studies & Geography at Hofstra University, observed that bubbles have four phases; stealth, awareness, mania and blow-off. 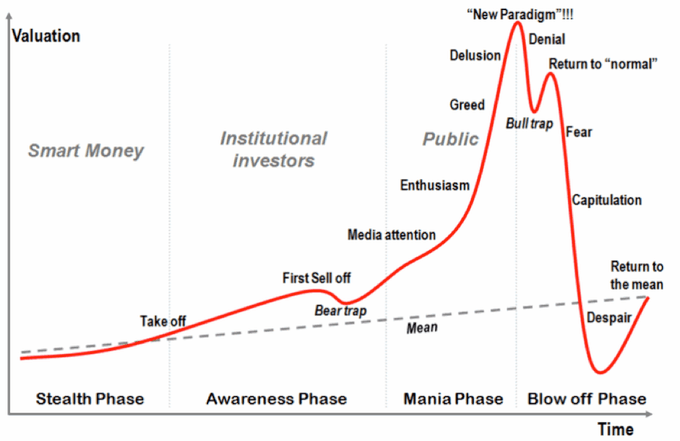 This chart is not intended to scare you but from my accounts we have certainly reached many of these stages. Greed has already been seen amongst Realtors (Shadow flipping), mortgage lenders giving out shady loans, governments lining their pockets with property transfer tax revenue up 43.9% this year. So where are we now on the above graph? Nobody knows for sure, but one could guess perhaps ‘Fear’. As noted since the foreign buyer tax was introduced Staggering Numbers Show Impact of Foreign Buyer Tax. Sales are on a downward trend and have been since May of this year for detached houses. Is this smart money leaving the market? Just a summer slow down? Or are prices finally out of reach for locals? 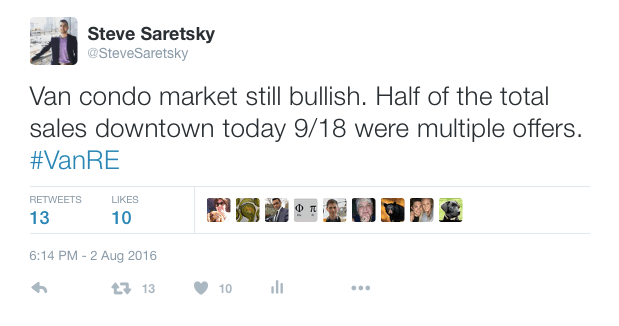 Yet condo sales remain red hot. Is this the last of the local market trying to get into the housing market because prices are still ‘affordable’? Perhaps it’s all speculation at this point. And like I have said before prices are impossible to predict which is Why I Stopped Predicting Vancouver Real Estate Prices. We don’t have enough “data”. It seems we never do. What I hope you will conclude from this post are the effects of FOMO. Don’t be tempted to enter a market you can’t afford as I have witnessed many others do. As the great Warren Buffett has said “real estate will always be cyclical.” Prices will always go up and down. If FOMO can drive tulips to record prices it can certainly do the same for real estate.